I purchased a Sieg SC2 lathe in December 2011. This was my first experience of metalworking (beyond a bit of drilling and filing). I had worked with wood and done various DIY projects ranging from decorating to roof-replacement to constructing a driveway, but I'd never had the space to get seriously into woodworking and I'd always liked the idea of being able to make whatever took my fancy. Metalworking seemed the ideal hobby! Since starting metalworking, I feel I must have read every page on every website on the subject. I've also read most of the books that you can get! With no background in metalwork, I was keen to soak up as much knowledge as I could. 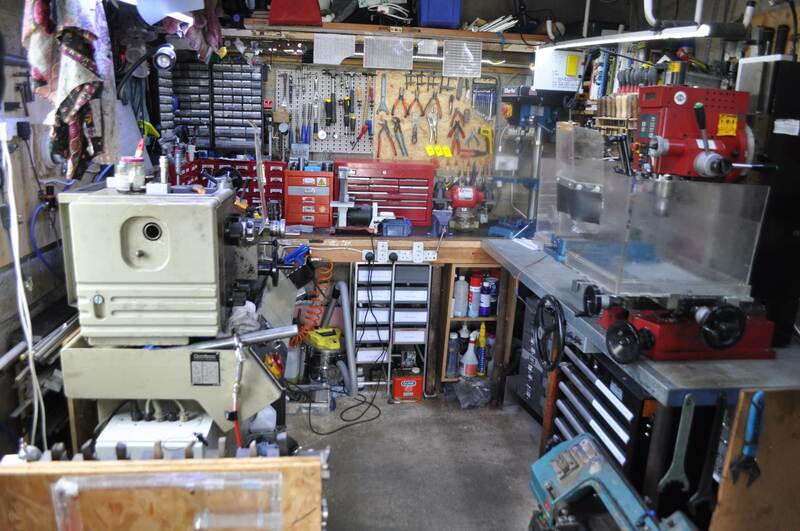 The inspiration I gained from websites like Mike's Workshop, GadgetBuilder, Tools and Mods and of course mini-lathe.com was incredible and without sites like these I wouldn't have known where to start. Now that I've done a reasonable number of amateur-ish projects, I thought it would be good to give a little back and write about some of my experiences learning about this fascinating hobby. Many (most?) of the projects on these pages are heavily based on versions on one or several of the websites listed above and I have tried to reference the original website wherever I can. Neither my machining skills nor my photography skills are a patch on those from those websites, so don't expect anything really exciting or beautiful, but hopefully there will be something of value to other newcomers to model engineering. I found it very difficult to find good projects to do with a tiny lathe and no mill: many of the projects that I found that claimed to be possible with just a lathe assumed a Myford ML7 or similar, which (presumably) is a lot more capable of milling than I've found the SC2 to be. A lot of the projects here were created without a milling machine (as I only acquired the milling machine in August 2014), so I've tried to highlight which projects were done just on the lathe/drill to help others getting started. If you'd like any more information on any of the projects I've listed, please use the contact form (there's also a link in the top right hand corner of every page on this site). There's some information about the tools I have in my workshop and links to the pages with more details here. As I said above, I read loads of websites and loads of books on the subject, so here's a list of my favourites: the ones that I found most readable and which taught me the most about the subject. Model Engineering: A Foundation Course - this is by far the best book I've read on the subject (possibly because it was one of the first). I read this from cover-to-cover twice! My only criticism of it is that it doesn't cover the milling machine, but at least that means it gives plenty of attention to the all-important lathe. Milling: A Complete Course - while certainly not a "Complete Course", this is a really nice guide to the basics of milling and everything is explained very clearly. Like most of the workshop practice series, the photos are all black-and-white and a little grainy, but the explanations make it very clear what's going on. Lathework: A Complete Course - again not really a "Complete Course", but it is a very readable book explaining a lot of the concepts required when getting started with a lathe. Some aspects of it I found fairly hard to apply to a lathe as small as mine and I quickly came to treat any reference to milling on the lathe as being not practical with my machine, but nevertheless it is still an excellent book. Milling (Crowood Metalworking Guides) - this covers the basics of milling very well and, while I don't rate it as highly as Peter Wright's book, it fills in a few gaps and has some very useful tips. Machine Shop Essentials: Questions & Answers - this book was hard to find in the UK: I eventually found it from an online second-hand book trader. It is an excellent book with lots of very clear pictures. I have a few pages of this photocopied and laminated in my workshop as I refer to them so often (e.g. the page on lathe tool sharpening). Machine Shop Trade Secrets - this book is focused on machining in a production environment rather than a home workshop, but nevertheless that are lots of interesting and useful ideas in there. The Amateur's Lathe - this book is a very good introduction to everything about the metalworking lathe, although in some places it assumes a bigger lathe than the mini-lathe. Mike's Workshop - you'll see Mike's website mentioned all over this site as it was the inspiration for a huge number of the projects that I've undertaken and I'd read every page of it before I even bought the lathe! GadgetBuilder - GadgetBuilder's website has lots of really interesting ideas as well and, while I find the colour scheme a bit hard on the eyes, I often refer back to it when I'm looking for something a bit different to try. Tools and Mods - if I could machine like that, or photograph like that, I think I'd be a very happy man! Harold Hall's website - Harold's books (two of which are listed above) are excellent and the website continues this theme but with colour photographs and drawings that can be printed out on A4 paper for ease of use in the workshop. mini-lathe.com - this is the standard reference website for the small Chinese mini-lathes. There's lots of useful information on there and quite a few drawings (sadly all in imperial units) for projects that can be undertaken. There are plenty of others I refer to occasionally, but these are my personal favourites.